Miss Berry acknowledges the gift from the World Wide Guild of the Fifth Baptist Church and notes she has sent a letter to the secretary of the organization. She also writes that she has written to Miss Hatch about the uniforms she wanted to supply. She thanks Miss Gill for all her help and tells her that she has had to cancel her speaking engagements because of her health. 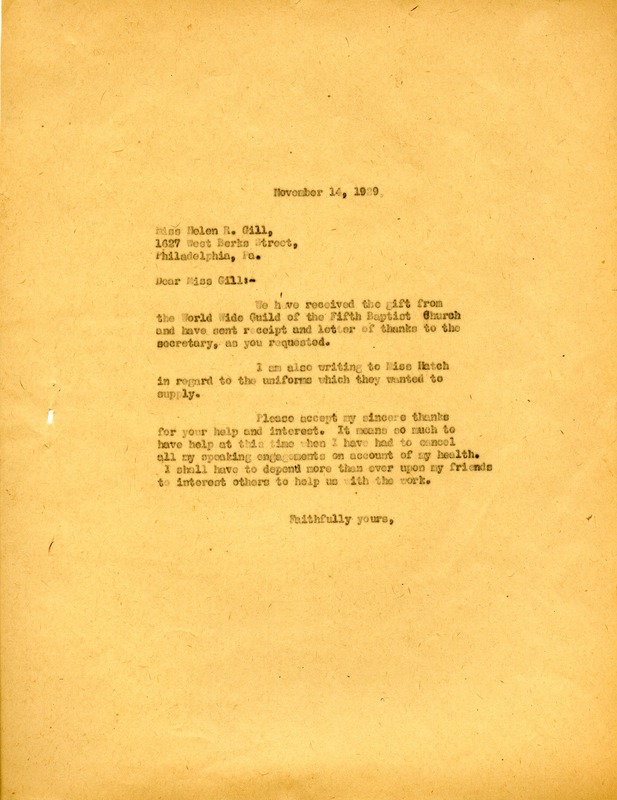 Martha Berry, “Letter to Helen R. Gill from Martha Berry.” Martha Berry Digital Archive. Eds. Schlitz, Stephanie A., Chelsea Risley, et al. Mount Berry: Berry College, 2012. accessed April 24, 2019, https://mbda.berry.edu/items/show/10095.